My consort and I took my six-year old granddaughter to a puppet show and then to Scottsdale Fashion Square for some shopping. We decided to grab a quick dinner before bringing her home and pizza sounded like the perfect kid-friendly meal. I wasn’t planning to review this eatery, mainly because food reviewers need a break once in a while to enjoy their social engagements—a busman’s holiday. Our last experience (read BOUNCED) made us gun-shy. We’ve been cooking at home for the last three weeks. We’re always looking for good pizza in Scottsdale and I remembered loving the coal brick-oven pie at Grimaldi’s a few years ago, so we finalized our restaurant choice and headed south on Scottsdale road. 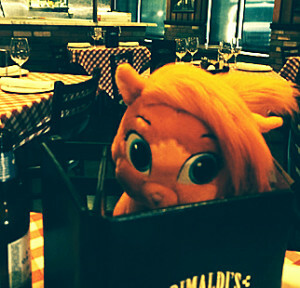 We arrived famished at 5:30 PM to find a quiet Grimaldi’s, which was out of character. Most of my visits have consisted of long lines at the door, noisy patrons, and waits of 15-30 minutes. Our order was simple: a Mediterranean salad and a large pizza with black olives, mushrooms, and onions. The salad came drenched in an overly tart vinaigrette. We told our waitress and she brought us a new dish of greens, dry and tasteless. The pizza arrived hot and our server dished out our first slices. It didn’t taste like I had remembered—crisp crust with a rich flavored sauce. This pizza had a metallic flavor with a damp cardboard texture. The scantily applied cheese made a polka-dot design and the mushrooms were under cooked. 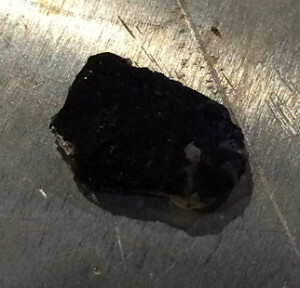 She acted as if it was a common occurrence and that this type of experience is expected when cooking with a coal brick oven. We then left and within moments my consort complained of a coal burn on the inside of his lower lip. I examined him when we arrived home (I’m a registered nurse) and found the affected area on his bottom lip. I’d display the photo here, but it’s not very appetizing. Needless to say, we were upset with Grimaldi’s casual, insensitive handling of this matter. I used to eat at this establishment once or twice a month a few years ago and never experienced this type of incident, service, or food quality. The waitress took the cost of the pizza off the check, but seemed to be indifferent about what had occurred. We are still on a mission to find a good pizza place in Scottsdale or Phoenix. If you know of any, please send us a name and address and we will give them a try.